Former two-division champion Conor McGregor is currently on a business tour to promote his Proper 12 whiskey in different states like Pennsylvania, Maryland, Chicago, Boston. Not only that this past weekend Mcgregor dropped the ceremonial puck for the Boston Bruins vs. Columbus Blue Jackets NHL hockey game at the TD Garden. He becomes an inspirational speaker as Irishman also delivered a fiery speech to the Boston Bruins before the game. To remind you it’s the same arena Mcgregor went on to defeat the Max Holloway back in 2013 via unanimous decision at UFC Fight Night 26. On the same night, Mcgregor took to Twitter and gloated about an old win over Holloway, but ‘Blessed’ completely shredded him in a multi Twitter assault. To that Mcgregor responded with an incendiary tweet. “I took my acl and shoved it up your arse that night kid. You don’t still have it by any chance? I’m lookin for it for years. Happy paddy’s day,” McGregor wrote on Twitter. Holloway was quick to fire back said to Irishman let’s throwdown on the international fight week in July this year. “There you go, that’s the OG champ champ the world wants. I do have it. White belt bum 21 year old Max gave it to me to return to you in Dublin. Glad you found your confidence again in Boston. You can find your ACL again in Vegas in July,” Holloway said. Holloway is currently slated to fight Dustin Poirier for the interim lightweight title at UFC 236. 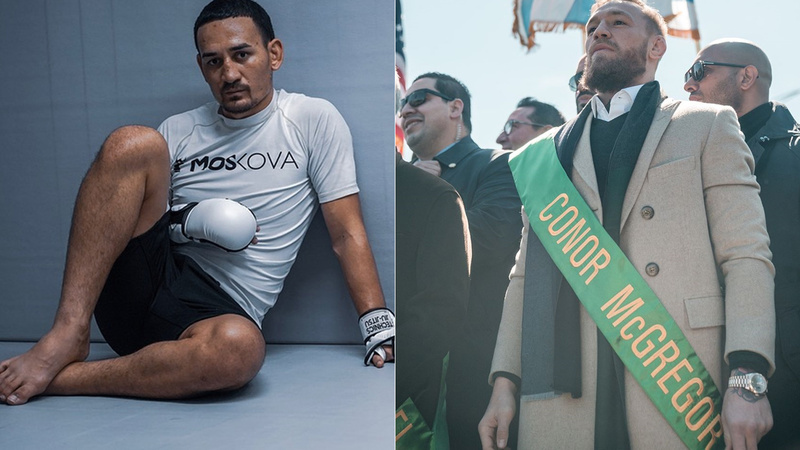 If ‘Blessed’ emerge victoriously, it’s expected he may face Khabib Nurmafomedov for the undisputed title. However, Holloway eyes a rematch with Mcgregor next. Conor McGregor meanwhile is coming off a fourth-round submission loss against Khabib Nurmagomedov at UFC 229 last October. At the moment he’s serving six-month of the suspension handed by Nevada State Athletic Commission for taking a role in a post-fight brawl and is eligible to return to competition this April. Moreover, he recently said he’s in negotiation for a summer return. So that means if Holloway is right, we could very well see a rematch this summer, assuming ‘Blessed’ beat Dustin this April. Last week Mcgregor was arrested on two felony charges for stomping on fan’s cell phone outside Miami beach hotel, later bailed out on $12,500. Do you think we could very well see a rematch between Mcgregor and Holloway this summer?